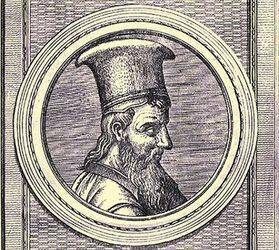 Strabo was a Greek historian and geographer who lived between the 1st century BC and the 1st century. Having made many trips during his life he obtained an overview of the ancient civilizations of his time, which he wrote down in two series of books, the first named "History" and the second "Geography". Strabo was born in Amasée, Greece, at a time when this city was Greek. Nowadays it is in Turkey, it is Amasya. He was born in 64 BC and died between 21 and 25 AD, exactly unknown. Having studied with the preceptor of the children of General Pompey, Aristodemus of Nysa, he continued his studies with Tyrannion, a geographer. 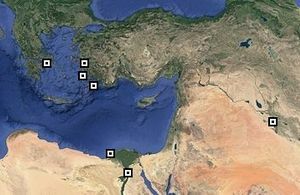 Around 24 BC he left for Egypt, then pursued a series of trips throughout the known world. He thus went to Italy, Rome, Brindisi, Populonium, and then to Egypt. He later visited Western Europe, the Iberian peninsula, Aquitaine and Brittany. It was when he returned to Amasée that he wrote his first series of books, "The history", then went on with the second series, "The geography". He participated in writing the list of the seven wonders of the world by describing the ramparts of Babylon, a wonder that is not part of the canonical list but which appears in some other older lists. If Strabo was a reference in geography, a history of his time, he was also a reference in philosophy and literature. On the other hand, his knowledge of science has never been put forward, such as mathematics or astronomy, which places it below certain illustrious Greek scholars such as Eratosthenes or Polybius. The interest of this character today is that it allows to have a vision of the time of these civilizations and especially of the Greek civilization of which it was derived. Through these texts we have the descriptions of various cities. The main problem with these texts lies in its reliability, since Strabo has not hesitated to use older texts to supplement his own documents. Besides, his descriptions of Eastern Europe are exclusively written from previous narratives and through testimonies having visited the place, himself having never been there. Moreover, he lived during a change of epoch, at the time of the end of the Greek Empire and the apogee of the Roman Empire, a time of cultural and commercial exchanges that helped the mixing of civilizations. In this context it was easy for him to mix information from a source with other information, extrapolating to a level where some writings can be questioned. However, scholars agree that his knowledge of Roman law is a good source of information on the Romanization of Europe. Geographically, these books are of great interest, but the purely cartographic vision of the world left much to be desired, which can not be blamed on the cartographic techniques of the time. Although he wanted his books to be as widely spread as possible, they remained confidential throughout the Roman era, going so far as to forget the name of Strabo. The latter was popularized again from the fifth century onwards and his books were rediscovered. 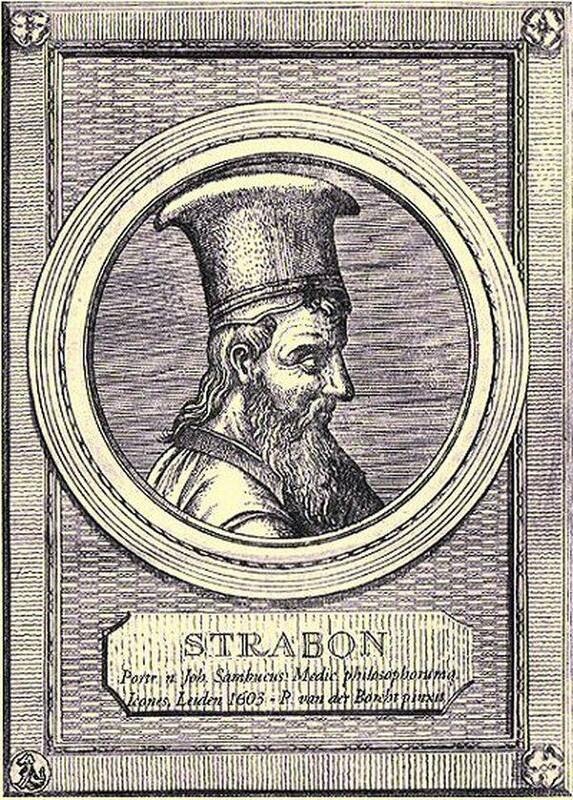 Strabon will be translated in the 15th century by Guarino Veronese. "Of seven times ten cubits Chares Lindien made it". Unfortunately, the colossus is now lying on the ground; overthrown by an earthquake, he broke down by falling from the knees, and the Rhodians, to obey a certain oracle, did not raise it. Besides this monument, which, as we have said, surpasses all the others (one universally agrees to classify it among the seven wonders of the world), we should also cite the two paintings of Protogenes, Ialysus and Satyr at the column. For the lighthouse of Alexandria Strabo described the port of the city, behind the island of Pharos, which gave its name to the word "lighthouse", an island a short distance from the land and connected by a dike. The point which terminates the little island of Pharos is itself only a rock beaten on all sides by the waves. On this rock rises a multi-storey tower, of white marble, a marvelously beautiful work, which is also called the Lighthouse, like the island itself. It is Sostrate of Cnidus who has erected and dedicated it, as a friend of kings, and for the safety of the sailors who sail in these parts, as the inscription on the monument attests. Indeed, as the coast to the right and left of the island is quite sheltered, it is also bordered with reefs and shallows, it was necessary to erect in a high and very high place a fixed signal which could guide the sailors coming from the open sea and prevent them from missing the entrance to the port. The passage or opening of the West, without being of very easy access, nevertheless does not require the same precautions. It also properly forms a port, a second port called the Eunostus; but it serves rather as a harbor in the closed port, an inner basin dug by the hand of a man. The great port is that of which the tower of the Lighthouse dominates the entrance, and the two other ports are leaned against it, the dyke or causeway of the Heptastade forming the separation. This dike is nothing more than a bridge intended to connect the continent to the western part of the island. The pyramid of Egypt is a little more detailed, but apart from simple description of these monuments the rest of the text does not rest on facts admitted nowadays. At forty stadia beyond Memphis there reigns a mountainous coast, upon which stand several pyramids, which are so many royal burials. Three of these pyramids are particularly remarkable. There are even two out of the three which are ranked among the seven wonders of the world, and nothing is more just: they are no less than a stage of height, their form is quadrangular, and the length of each of their sides is only inferior to their height. One of the two pyramids is a little bigger than the other. At a certain height on one of its sides is a stone which can be removed, and which, once removed, shows the entrance of a tortuous or syringe gallery, ending at the tomb. These two pyramids are built side by side on the same level. Farther on, and on a higher point of the mountain, is the third pyramid, which, though of much smaller size than the other two, is, however, much more expensive to construct: this difference is due to the fact that, from the base up About half the height of this stone was used, except that black stone, which also enters into the composition of the mortars, which are brought from the mountains situated at the extremity of Ethiopia, and which, by its extreme harshness and difficulty in being worked, greatly increases the price of labor. The tomb of King Mausole is very little described, it is just quoted as proves this short text not very explicit. Then came Halicarnassus, the capital of the ancient dynasts of Caria, which was originally called Zephyria. It is here in Halicarnassus that the tomb of Mausole, a monument ranked among the seven wonders of the world, is erected by Artemisa in honor of her husband.